Hey Folks! The online store is going to be closed for a while because I’m moving. And since we need to do some work on our house and then list it for sale, I need to pack everything up. Once we get settled in our new place, OOSA will be back open for business. In the meantime, a lot of the artists will be selling things on their own websites and traveling around the country going to conventions where you can pick stuff up as well. Click on the artists’ profiles to get links to their individual sites and social media accounts to get updates. Award nominations are being announced and the OOSA/Print Shop artists have been fortunate enough to snag a couple! 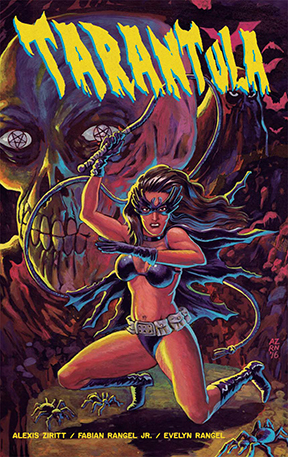 Rosemary Valero-O'Connell was nominated for two Eisner Awards for her one-shot comic What Is Left; "Best Single Issue/One-Shot" and "Best Coloring". Alexis Ziritt was nominated for a Dinky Award in the "Best Work From A Mid/Large Press" category for his work on Tarantula. OOSA Print Shop artists Jeffrey Alan Love and Charles Vess were both nominated for Locus Awards. Jeffrey was recognized for his work on Norse Myths: Tales of Odin, Thor, and Loki in the "Art Book" category, and Charles was nominated for "Best Artist"! You may have heard that Chris Visions will be undergoing eye surgery to repair a damaged cornea due to a degenerative eye disease (Keratoconus). That's not ideal for an artist to have to go through, but the good news is that he's already scheduled for the surgery at the end of the month and that, thanks to the kindness of friends, family and fans, Chris was able to raise the money he needed to cover the $6400 deductible so his insurance will cover the rest! Since Chris will be out of commission for a while after the surgery while his eye heals, we've added a bunch of his work to the OOSA Print Shop for a limited time for you to purchase. 100% of the proceeds will go to assist Chris during his recovery. (Same goes for any of Chris' original art sold during this time.) Thanks in advance for your support! Hey folks, I'll be on a break until the new year. The store will remain open, but all orders from this point out won't ship until January 2018. Be sure you take advantage of Nathan Fox's original art sale, as well as Jeffrey Allen Love's print sale, though, because those both only last though the end of the December. Best wishes to you and yours and I'll see you next year!!! And the newest OOSA artists is... Rebecca Kirby! It's funny how things work out sometimes. As you know, Rebecca was our guest artist at SPX last month, but she wasn't the first person I asked to take the spot. She was the first to be able to make it given the short notice, though. And in asking her to be our guest at the show, it wasn't my intention to recruit her for OOSA, even though I love her art and had been keeping my eye on her career for a while. Her guest appearance at SPX wasn't a trial run or anything pre-planned. Heck, I hadn't even ever emailed her, talked to her, or met her in person prior to that. But, as soon as she got set up at the show, I knew she would be an awesome addition to the crew. She had worked really hard to create several new comics and prints in the short time she had to prepare for SPX, had a killer show (her first time doing a show that large), AND she took up with everyone immediately like she had known them for years (as did everyone with her). I ended up talking to the other OOSA artists who were there at the show over the weekend about having her join OOSA and they were all for it. We ended up inviting her to become part of the collective at dinner after the show on Sunday night. Just like all of the OOSA artists, Rebecca has a strong, unique style that can be appreciated across a wide variety of art/comics enthusiasts, a great work ethic and a positive personality. 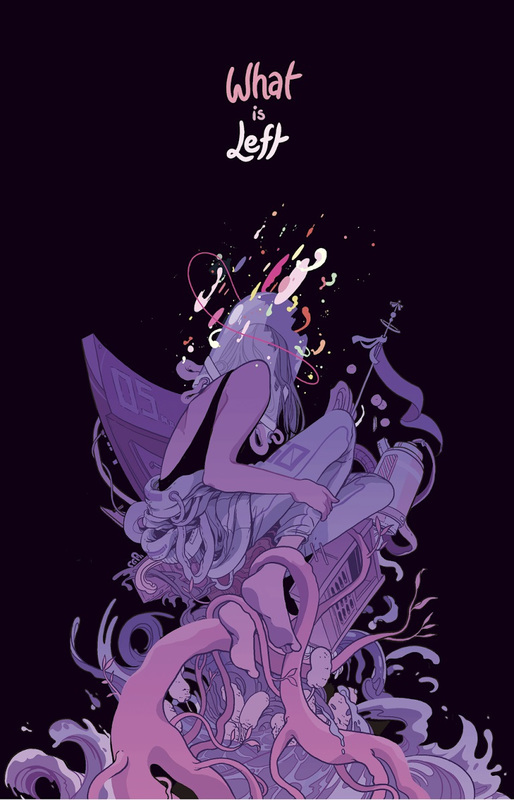 She has a really promising future in comics with secret things already in the works, and brings a wonderful energy with her that is evident both in her art and when you meet her in person. I'm excited to be working with her and for you all to get to know her. Click HERE to check out Rebecca's OOSA bio page to learn more about her, see samples of her work, and find links to follow her online. We'll be adding prints, comics and other items to the store soon. SPX 2017 is less than a month away, but we're already getting excited about it! As you've probably heard, Alexis Ziritt (Space Riders, Tarantula) is going to be a special guest of the show this year, so I'm sure he'll be involved in the (as of yet unannounced) programming. We'll keep you posted as to topics and times once they're released. - Artist for the upcoming "Laura Dean Keeps Breaking Up With Me" and "Black Sun Rising"
Rosemary Valero-O'Connell with her new comic "What is Left"
We are also super excited to have Rebecca Kirby as a special guest at our table! Rebecca has done a pinups for Andrew MacLean's Head Lopper, Farel Dalrymple's new comic Proxima Centauri, and others, as well as her own zines and comics. Be sure you check out her work on Instagram (@reweki), in her shop, and of course at the OOSA booth at SPX September 16-17!! OOSA artist Liz Suburbia (Sacred Heart, Cyanide Milkshake, Egg Cream) will also be at the show sitting with our friends at Czap Books, so be sure to swing by and visit them. We'll be at our usual spot on the convention floor in the corner (W44-46). More details are on the way so stay tuned!! The best comics lure you into their worlds with magic, myth, minutiae, and more. It can be the smallest detail that changes you from a reader to an active participant in the story. Vince Hernandez (Aspen Comics) trades worldbuilding secrets with master storytellers Marjorie Liu (Monstress), Roxane Gay(Black Panther: World of Wakanda), Dustin Nguyen (Descender), Liz Suburbia (Sacred Heart), and Marguerite Bennett (InSeXts). Cartoonists and special guests Simon Hanselmann (Megahex) and Liz Suburbia (Sacred Heart) discuss their cartooning careers and the best practices for transitioning your stories to a physical format. Hear from award-winning cartoonists about the pros and cons of web versus print, tips for getting work noticed, and where to go after you make the jump. Moderated by editor Eric Reynolds. Liz Suburbia (Sacred Heart, Cyanide Milkshake) sits down to discuss her work and influences with artist and publisher Kevin Czap (Czap Books, Füchi Perf), followed by a Q&A session. Sunday July 23rd 12:15 – 1:45 p.m. The OOSA Crew will be back at Heroes Con again this year and teaming up with the Albatross Exploding Funny Book gang to take over an entire block! We'll have a couple of debuts at the show, including Paul Maybury's new PLAYBURY sketchbook and his new comic "A New Terror". Chris Visions did a special Heroes Con cover for BABY TEETH #1 that will only be available at the show, so don't miss that. We'll also have a limited edition print set from Vanesa R. Del Rey which contains three 13"x17" signed/numbered giclee prints and an original sketch, all in a special printed envelope for $150. Plus, the group will have original art, comics, prints, shirts and more! was founded by Neil Bramlette to support and promote emerging and established artists who are not only interested in working in comics, but also have interests in other forms of visual art cultures, story development and printed matter. From mainstream to DIY/Indi comics, editorial illustration to concept development, animation and beyond - Join NATHAN FOX, ANDREW MACLEAN, ALEXIS ZIRITT, PAUL MAYBURY, LOGAN FAERBER, CHRIS VISIONS, and VANESSA DEL REY for a conversation with OOSA artists about how they defined their unique voices, maintain their art practice and get a rare glimpse into their craft, process and contribution as professional storytellers and myth makers. With interests in comics and comics’ culture reaching new heights, and the convention scene exploding, many of the industry’s creators have turned to merchandising their art and ideas to create a broader, more resilient income stream. Join Jason Wood (11 O’Clock Comics podcast) in a discussion with four of the industry’s most innovative merchandisers ANDREW MACLEAN, RICO RENZI, JIM MAHFOOD, and SARAH DYER to discuss how they’ve monetized their artistic efforts beyond the comic book page. Last year, we argued for over two hours about the need for a Comics Canon and what comics and creators belong. We got nowhere and it was a blast. This year we are tackling Books ABOUT COMICS. What are the ESSENTIAL—Historical Anthologies, Biographies, Analytical Essays, Histories, How-to, BOOKS on the subject of COMICS? Join moderator Tom Spurgeon (The Comics Reporter) and our resident brain trust: CRAIG FISCHER (Appalachian State) NATHAN FOX (SVA) DANIEL YEZBICK (St. Louis CC), AARON KASHTAN (UNC Charlotte) and MICHAEL KOBRE (Queens). AUDIENCE PARTICIPATION IS A MUST!!! This is a GREAT way to end a weekend filled with Comics love! Alright, back to work. The store is open again. I'm going to out of town for a bit so I'm closing the store until I get back. We should be open again around June 5th. TCAF is The Toronto Comic Arts Festival, taking place in 2017 at Toronto Reference Library and the surrounding Bloor/Yonge neighborhood in Toronto, Ontario, Canada. It is celebration of comics and graphic novels and their creators, which culminates in a two-day exhibition and vendor fair featuring hundreds of comics creators from around the world. Other Festival events include readings, interviews, panels, workshops, gallery shows, art installations, and much more. 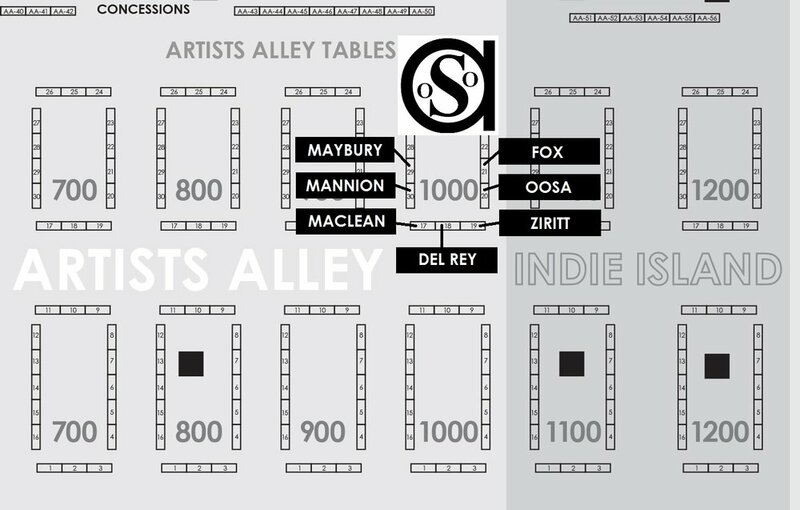 OOSA artists Alexis Ziritt, Andrew MacLean and Rosemary Valero-O'Connell will be there taking part in the festivities (although Rosemary won't be tabling). Be sure you catch Alexis and Andrew's panels on Saturday. 10:00AM – Aesthetics of Sci-Fi – We can all agree that robots are the future…but what’s that going to look like? When we upload our consciouses into the cloud, what will we see? What about those trippy parts from 2001? Come and listen to some of the most stylish creators in sci-fi talk about not only the amazing advances that the future holds, but also what it’ll look like when we get there!Panelists: Wren McDonald, Ben Sears, Alexis Ziritt, Kelly Kwang, Beatrix Urkowitz. Moderator: Sloane Leong. 02:45 PM – Image 25th: Designing New Worlds – Magical Monsters! Terrific Technologies! Alien Alternatives! When the realy world isn’t big enough for your ideas, sometimes you’ve got to build your own! Join Jamie McKelvie, Sloane Leong, Simon Roy, and Andrew MacLean as they discuss what it takes to design a whole new world to contain your stories. Catch the OOSA artists out and about at your favorite comics gatherings this spring! Keep your eyes peeled for these books and more from the OOSA artists in 2017!